Symptoms Lyme Disease - WHY would I write about Lyme disease on a DENTAL website? BECAUSE a common side-effect of Lyme is to cause pain in the jaw, around teeth, that can be mistaken for a tooth problem. Sometimes teeth have been extracted, only to have the pain come back! Lyme disease is a relatively common infection, caused by bacteria, and it occurs in parts of the country where there are a lot of ticks. The bacteria responsible for symptoms of Lyme disease is called Borrelia burgdorferi, and the way it is spread is by tick bites, from the Ixodes tick. 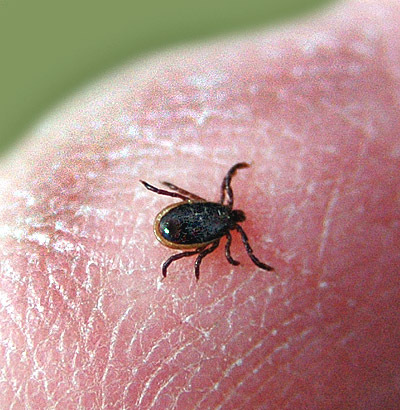 When an infected tick bites a human, the bacteria is transmitted by the bite, and the resulting infection is known as Lyme disease. Tick bites occur quite often in many different areas of the world, BUT only a small number of ticks carry the infection. SO, it's important to remember that NOT all tick bites will result in Lyme disease. ONLY those ticks actually carrying the bacteria Borrelia burgdorferi can transmit Lyme disease infection, and subsequently symptoms Lyme disease. How do you know if you have a serious infection that needs treatment? How can it be treated and what is the outlook? For more information about ways of testing for Lyme disease, have a look at my page on Lyme disease blood tests. Lyme disease affects multiple systems in the human body. It can affect the joints, and can look like the patient has arthritis. Lyme disease can also affect other areas of the body, including peripheral and central nervous systems. This bacterial infection can be severely debilitating; without treatment it can even be fatal. Therefore, it is very important to understand the symptoms Lyme disease, and how those symptoms can be diagnosed and treated. There are many different signs and symptoms to be on the look-out for if you think you may have been exposed to ticks, or have actually been bitten by a tick. The first commonly associated symptom Lyme disease is the erythema migrans lesion. This is the medical term for the "bulls-eye" lesion that is commonly seen with tick bites. If a "bulls-eye" lesion appears anywhere on the body, it is pretty certain that the patient has been bitten by a tick, and should see a doctor for confirmation and to decide next steps in the treatment process. changes in smell or changes in taste. Read more about sleep disturbances at MY INFORMATION PAGE - Lyme Insomnia. That page has A LOT of information about how to deal with the insomnia that frequently accompanies Lyme. Symptoms of Lyme disease can vary a LOT from patient to patient. Many of those symptoms can also be associated with OTHER medical conditions, which can result in misdiagnosis. For example, most folk do not realize that jaw pain associated with Lyme disease may actually look like a tooth abscess, or a TMJ (jaw joint) problem. It is actually often misdiagnosed as TMJ! SO, if you have a jaw or tooth pain that your dentist cannot explain, you should consider the possibility of Lyme disease. Some of those symptoms of Lyme disease listed above only occur if the disease becomes systemic and spreads throughout the whole body. The spread of the infection through your entire system can be prevented if the disease is diagnosed and treated in its early stages. There are some other important signs and symptoms that, as a patient you should be aware of, if ever exposed to this disease. Lyme disease as it is associated with insomnia, Lyme Insomnia. The blood test that identifies Lyme disease, Lyme Disease Blood Test. How to treat Lyme Disease, Lyme Disease Treatment. and the history of Lyme disease, Lyme Disease History. Going forward, understanding these areas will help to evaluate those key signs and symptoms that can help diagnose this disease in its early stages. Lyme disease affects many people; and therefore, this topic is an important one to discuss.